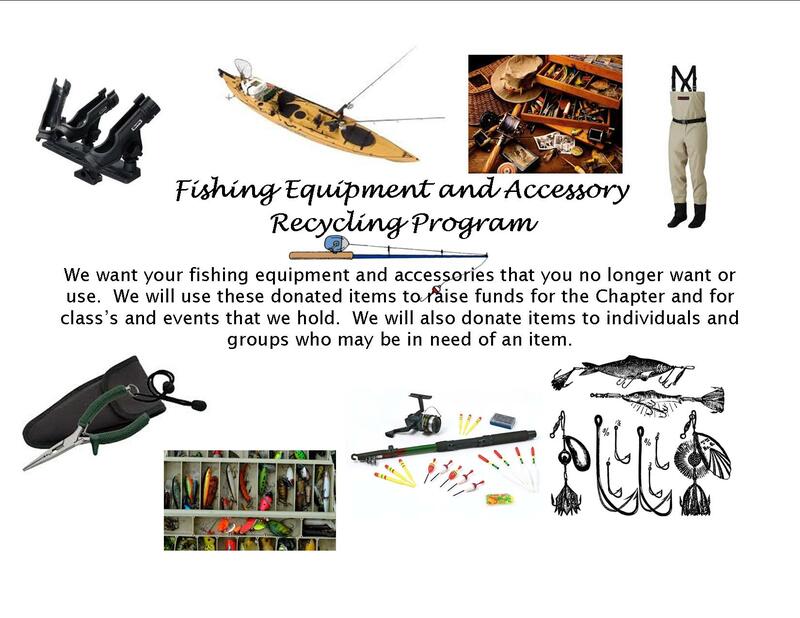 In an effort to further help those in need and to reduce the amount items being sent to the landfill, the Chapter has started a recycling program for fishing equipment and accessories. We want your old line, hooks, lures, weights, waders, vests, poles, fly tying materials, and anything else related to fishing. We all have items that are stored away in the back of a closet or in a box under the bed. These items may not be of any use to us anymore but we just haven’t thrown them away and we don’t want you to throw them away. Give the items to us and we will use them in our programs, donating them to others who may need them, or selling them to raise funds for the Chapter. We are also collecting your items that are broken and can be recycled (old fishing line, lead weights, hooks, old broken lures, etc). Give these items to us and we will see that they are properly recycled and not sitting in the landfill. We have been very fortunate to have had significant donations made to the Chapter over the last year. Because we no longer host the Trout Kickoff in the spring, we needed another fundraiser for the Chapter and because we received such a tremendous response to this program, we have been able to sell much of this merchandise and raise money for the Chapter. We have donated items to the Boy Scouts so that they can build their own fly rods and the materials have been, and are being used, in the fly tying class’s that we offer. Because of the donations we have received, we are able to provide the fly tying class’s free to all participants. If you have anything that you would like to give to the Chapter or recycle, please contact Bob Baker (boblbaker@comcast.net) to arrange for pickup of your items. You can also bring items to any Chapter meeting or event. A receipt will be given to you showing your donation and fair market value of the items so that you can use your donations toward your taxes. Some of the things that have been donated to the Chapter include: all types of fishing rods and reels, fly tying supplies and tools, numerous rod cases, maps, books, movies and DVD’s, Lure Making Equipment, Rod building materials and equipment, coolers, lures, flies, waders, a float tube, patches, tackle box’s, And Much More!!! !